If I were to ask 10 people if they wanted to make more money chances are pretty stacked in my favor that I would get 10 out of 10 that respond with a “yes”. If I were to ask on a scale of 1 to 10 with 1 being minimum wage and 10 being the highest where would you want your earnings to come in. Again, I am certain that I will get a “Level 10” response. For professionals, their level of income is predetermined by many factors. Experience, education, past earnings, and skill along with the value of the particular position to the organization are a few keys that determine how their income level is set. Once established, let’s say at a Level 5, it’s very difficult for that employee to get it to move. There may be some type of monthly or quarterly incentives that can help give a short term boost, but nothing level changing. At the end of an entire business year they may be eligible for a merit increase if their company is able to do so, but again, the 2% they receive is not going to get them to the next level. It can take years to move to the next income level. If you are in sales so you are very different. You are fortunate. You have within you the power to determine your income level. I know that’s a little pie in the sky. You’re not going to keep your job very long if you determine you want to be at Level 1 and if you think you need to be a millionaire to be at Level 10 that just may not be available. You do have control if you are a Level 5 or a Level 6. You can decide to work on your skills, know your product, be a company advocate and network and take yourself to a Level 7 or a Level 8. If you are already a 7 or 8 you can take it to 9 or 10. The best news is that you don’t have to wait for a year end review and hope that your boss determines that you are worthy. No, you can decide today! You can change your behaviors TODAY! 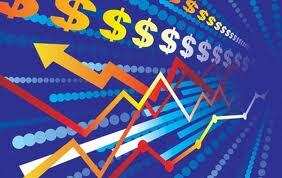 The state of the economy in the outside world does not matter to you if you are in sales. What matters is the state of the economy in your world. You create it. You affect it. You own it. You have control of your own personal economy. I am going to take it one step further for you and be real specific. Let’s say, for this example that “average” equates to Level 5 since it is right in the middle and I am going to make up a salary for average. Let’s also say, to keep things simple, that every $10,000 in annual income moves you up one level. This is not for you. You do not have to wait 4 years to get the next level. 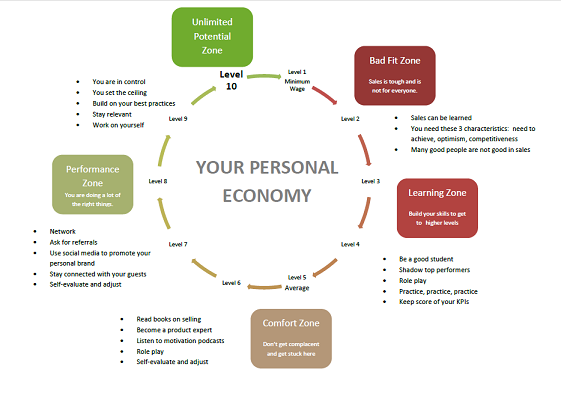 You can improve your own personal economy today. Let’s say your company pays 5% commission. You would have had to sell $840,000 worth of goods or services to be at level 5 and earn $42,000. Your productivity would only need to go from $70,000 to $73,500 monthly to earn the same increase as the professional. What if you could create a fifth week? What do I mean? What if you increased your productivity so that your sales in 4 weeks rose to what you sell in 5. The best part is there is no ceiling. You can keep going as high as you can and your income keeps going up with it. I haven’t heard of a sales position where you will be told “sorry, you’ve hit the maximum delivered business allowed, we don’t pay after this level”. Keep climbing. You deserve it. What are you going to do to change it? Share your economic growth plan below.